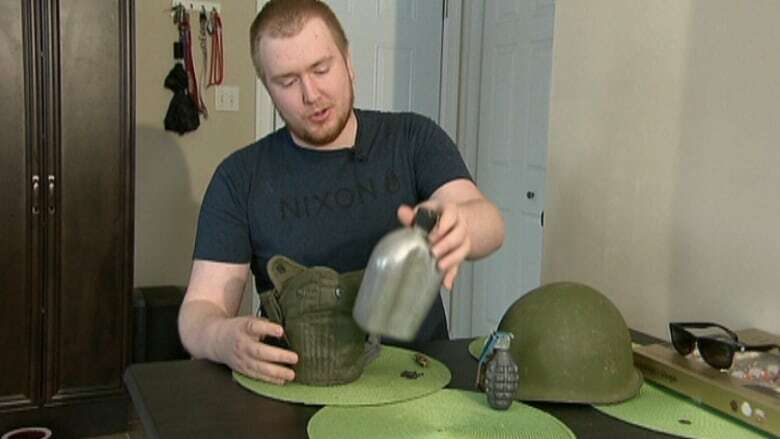 Jordan Chiasson bought an old military helmet in an army surplus store in Moncton, N.B., for $30 last summer, but the joy he created for the Second World War soldier who owned it is priceless. Jordan Chiasson bought an old military helmet in an army surplus store in Moncton, N.B., for $30 last August, but only recently discovered the name GW Johnston and a number scratched into the inside of it, so he set out to find the owner. War memorabilia collector Jordan Chiasson reunited George Johnston, a 93-year-old veteran, with the helmet found in an army surplus store in Moncton, N.B. (CBC)"The fact that he cared enough about it to write his stuff inside — his name and the ID number — it wasn't mine to keep," said Chiasson. "If he cared so much he wrote his own info inside, it was up to a matter of time." Chiasson, 21, contacted Royal Canadian Legion Command in Saint John and the Canadian War Museum. He was led to Pte. George Johnston, a member of the North Shore Regiment in the Second World War. This week, after a three-day search, the soldier and his helmet were reunited for the first time in 70 years when Chiasson took it to Johnston and his wife, Annie, at their home in Norton, N.B. "They came to the door," recalled Chiasson. "He rolled right into the entrance area, just looked at me and said, `22694.' That's the first thing he said. "I looked inside and that's the exact number it had written on it, so I knew I had the guy," said Chiasson. "It was just really nice to give something back." Johnston and that helmet spent six years together on the battlefields of Europe, serving in England, France, Belgium and Germany during the Second World War. The last time he wore the helmet was on the outskirts of Berlin in 1945. The war was over. "I could have kissed it," said Johnston, 93, who struggles with speech due to a stroke a few years ago. "That's what it felt like. 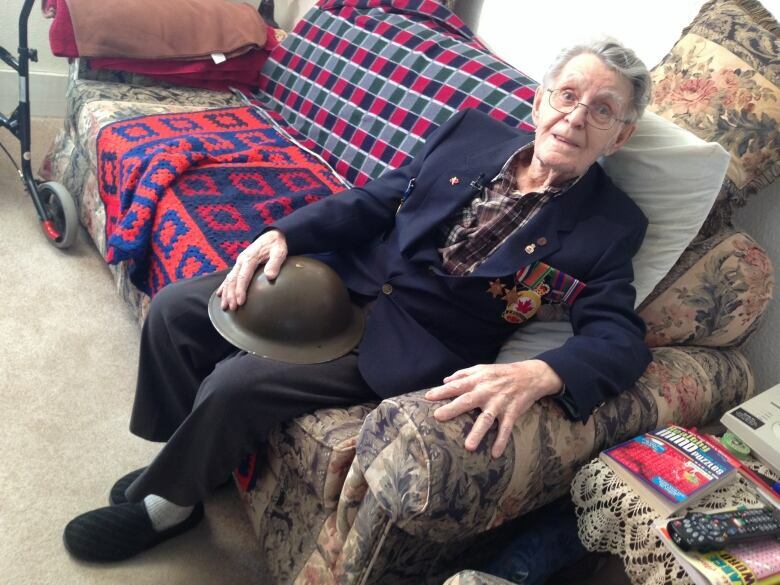 George Johnston, a Second World War veteran living in New Brunswick, last wore his helmet outside Berlin in 1945. (Jessica Doria-Brown / CBC)"I can't explain it the way I feel … what it's done for me," he said with a smile. "He just kept looking at it," said Johnston's wife, Annie. "I don't think he could hardly believe he did have it until Jordan showed him the name. "But he told Jordan his rank number right away. He always remembered that. He's quite pleased to have it." Johnston doesn't remember writing his name in the helmet and can't remember how it disappeared. He doesn't remember bringing it back to Canada after the war. Chiasson says it "feels great" to have reunited Johnson with his helmet. "I've been smiling ever since," he said. "My girlfriend says she's never seen my eyes light up so much. "And it's nice to see an old fella with his eyes bright, looking at the thing he held 70 years ago and hasn't seen since." An earlier version of this story had George Johnston's last name spelled incorrectly, as Johnson.